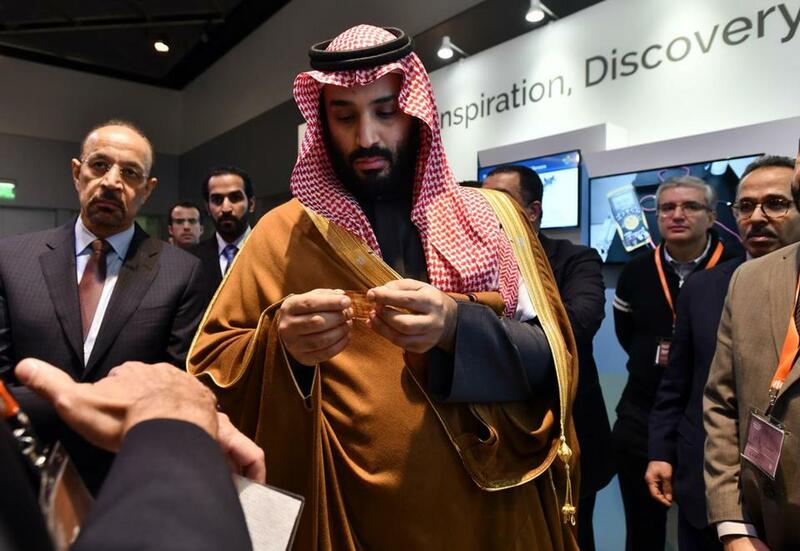 Above: Saudi Crown Prince Mohammed bin Salman visited MIT’s campus in March 2018. Right now, MIT, Tufts, and other local universities are grappling with important questions: Is it OK to accept tainted money when it funds a just cause? Is it ever right to accept donations that help deplorable people launder their reputations? MIT answered both more or less in the affirmative on Wednesday, announcing that it would not sever its financial and research ties with Saudi Arabia. This, despite the kingdom’s heartless role in the civil war that has brought Yemenis to their knees, and the growing certainty that Crown Prince Mohammed bin Salman ordered the murder of Washington Post columnist Jamal Khashoggi. There’s no question MIT’s ties with the kingdom have legitimized its autocratic ruler: When Salman visited MIT (and Harvard) in March, university president L. Rafael Reif spoke of his country’s “promising new future.” A photograph showed Reif warmly holding the ruler’s hand in both of his. On Wednesday, Reif sought to undo that disastrous PR by condemning Saudi Arabia’s “brutal human rights violations, discrimination and suppression of dissent, including the murder of Jamal Khashoggi.” But he stopped short of terminating relationships between MIT and institutions controlled by the Saudi government, arguing that the partnerships involved “worthy Saudi people who share our principles and are doing good work.” He said it would be up to individual researchers to decide whether to continue their connections with the kingdom. Reif didn’t go nearly far enough. Surely there’s a way to avoid entanglements with a brutal regime without severing working partnerships with, and scholarships for, its unfortunate subjects. Saudi money represents just 0.2 percent of the university’s operating budget, officials told the Globe. MIT should replace that tainted money from its own hefty coffers. Because as long as MIT continues to accept funds from the kingdom, its denunciations ring hollow, and its own reputation suffers. The same goes for Harvard, Babson, and other universities with ties to Saudi Arabia. The question of questionable partnerships, this time with big business, is more clear-cut — and more damning — at Tufts University. There, officials are grappling with troubling revelations in Attorney General Maura Healey’s lawsuit against Purdue Pharma. The company has been accused of pressuring and misleading doctors and the public about its blockbuster opioid OxyContin, deceptions that helped fuel an epidemic of addictions. At Tufts, Purdue’s donations didn’t just launder the company’s image: Purdue, owned by the Sackler family, turned Tufts into a marketing arm for its dangerous opioids. And, according to the complaint, faculty at the Tufts Sackler Graduate School of Biomedical Science were all too willing to help. A 1999 Purdue donation established a Master’s of Science in Pain Research, Education and Policy at Tufts. There was an annual Sackler lecture on pain medicine — no conflict there! The program “bought Purdue name recognition, goodwill in the local and medical communities, and access to doctors at Massachusetts hospitals,” the complaint says. According to e-mails and other internal documents obtained by the AG, Purdue staff taught a Tufts seminar about opioids, and influenced the curriculum — and doctors connected to the school — in other ways. In the wake of these astounding revelations, Tufts has vowed to review its connections to the Sacklers for possible conflicts of interest. That ought to take about five minutes. Tufts has been compromised to the point where the only way back is to cut off Purdue and the Sacklers, no matter the cost. Reasonable people can disagree over whether museums should sever connections with compromised donors like Saudi Arabia or the Sacklers. There’s not nearly as much moral wiggle room at colleges and universities, which are in the business of shaping young minds, and urging students to try to do good in the world. Time to practice what they preach, and not what pays.